Jenn Cochran’s comments also suggest it may have been a bank, though it’s likely a safe would have been present in a post office. Hello. 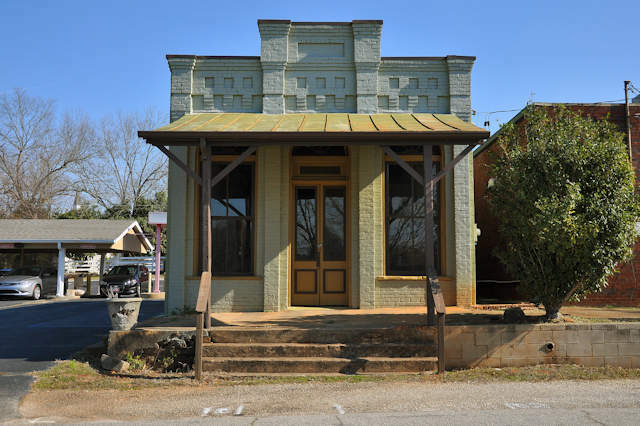 The building that you have labeled a general store, was in fact, another bank. It is one large room in the interior of the building, with the original vault and still-working, solid metal vault door to the rear of the room, on the right side. The family who now owns it acquired it through a will of a passed loved one. They also own the two-story house that has the full upper and lower front porches on it….just down the street, on the same side of the tracks. I got all of this info from city hall, when inquiring about who to speak to in town, about renting the building in your photo. My name is Susan Cooley. My great-grandfathers name is Pledger Cooley. We have inherited the building, and house mentioned above. My family has always called the building the “post office”. There is a very ornate vault. The store front has been so many things in my life time, from an old VHS rental store to a flower shop. I married a handy man, Brian McClain ( I still carry my beloved maiden name) who has been busy renovating the properties. He has worked diligently, hanging off a ladder with buckets of mortar and patting it into the old bricks to preserve and weather proof the building ,without to much modernizing. We are very committed to historical relevance. I actually found this sight doing research for a middle school project my son is working on. Its so welcoming to know, our ancestors property is considered a land mark in Banks County. Susan- Thanks for this information and yes, I would certainly call it a landmark. It’s great that you are restoring and stabilizing these important places.